Claudia Raffo entered her first pageant at the age of 17 and won the title of Miss Lights of the Delta. 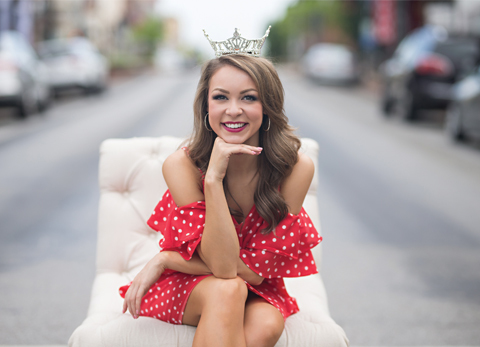 Five years later, the new Miss Arkansas is looking forward to competing in the Miss America Competition in September and appreciates the opportunity to travel the state of Arkansas to spread awareness about the organization and her platform. Although her title going into the 81st annual Miss Arkansas Scholarship Pageant was Miss Historic Batesville, Raffo moved to Jonesboro in 2007 when her dad, Tommy, took the head baseball coach position at Arkansas State University. The Nettleton High School and A-State graduate says she loved her teenage and college experience in Jonesboro and is thankful for the local support she has received over the years, which she has felt from her very first competition at age 17. She walked away that year with a little more than $3,000, prompting her to enter Miss Northeast Arkansas the next year, during which she earned more than $9,000 in scholarships. She then took a year off to enjoy school, the dance team and her sorority. It was also the year she was diagnosed with Crohn’s disease. Last year, she came back to Miss Arkansas and finished the competition as fourth runner up. Raffo says that what she is most looking forward to about her year as Miss Arkansas 2018 is the opportunity to share her platform, “New Life Saves Life: Umbilical Cord Donation,” with everyone in the state she proudly represents. The 2018 Miss Arkansas’ cause is near and dear to her heart because umbilical cord donation extended her grandma’s life during her third battle with cancer. “When I had to pick a platform for the Miss America system when I started competing, beyond a shadow of a doubt, I really knew what I wanted to focus on,” said Raffo. “When I was 11, my grandmother (Hattie) was diagnosed with cancer for the third time. She had had breast cancer, then Hodgkin lymphoma and then she was diagnosed with leukemia. Because of the radiation from her two previous cancers, she needed a bone marrow transplant but couldn’t find a match through the national bone marrow registry, and none of her family members were a match. So, she underwent an experimental procedure using umbilical cord blood to have a stem cell replacement, which extended her life nine months before she passed away from the leukemia. Raffo says that donating umbilical cords is easy and free. It can be used for research purposes, or it can be used to help another person. For more information, go to Raffo’s website, Hattiesmatch.com. After deferring her admittance to pharmacy school at the University of Arkansas for Medical Sciences until her time as Miss Arkansas is completed, Raffo will be able to spend the next year sharing her platform and her passion for the Miss America organization all across Arkansas. She will also serve as an ambassador for Arkansas Children’s Hospital and will help raise funds for Children’s Miracle Network. Before she begins traveling the state, Raffo will first head to Atlantic City, N.J., where she will compete in the 2019 Miss America Competition. Three nights of preliminary competition will take place at Boardwalk Hall before the Miss America Show Us Your Shoes Parade on Sept. 8 and the live, televised competition on Sept. 9. Raffo says she is excited to bring a little piece of Jonesboro with her to Atlantic City for the parade. Although she is saving hers for a surprise, she said contestants typically bring something that describes them, their platform or their state. She says her experiences the past several years have made her stronger in many ways and have prepared her for her year as Miss Arkansas and the upcoming Miss America Competition. “The biggest thing I’ve gotten out of (competing) is the ability to express my thoughts and communicate effectively,” said Raffo. “A huge portion of the Miss America system is the interview part, and it’s so crucial. You have a private interview with a panel before you ever step foot on stage; those are the moments they really get to see who you are as a person. They ask you about everything from your favorite color to what you think of the president to ‘Can you tell me a little about your social impact platform?’ You get to really have that one-on-one time and get to make an impression on them, so it’s really important to say everything you want to say in the time that’s allotted. Raffo says she is so thankful to her friends, family and the Jonesboro community for all their support over the years. She is especially appreciative of her parents, Tommy and Paula, her sister, Anna, a sophomore at A-State, and her brother, 11-year-old Ford. The 2019 Miss America Competition will air live on ABC on Sept. 9. To keep up with Miss Arkansas 2018, Claudia Raffo, follow her on Instagram at @missamericaar and @claudiaraffo or find her on Facebook. Editor’s Note: The evening gown worn by Raffo during the Miss Arkansas Pageant and shown in the photos is a custom design by Tony Bowls from emerge in Conway. 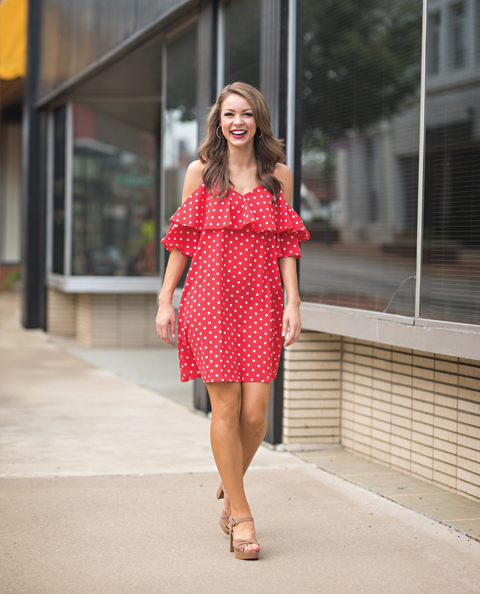 The red polka dot dress was provided by The Shabby Pig in Clarksville.